How does caffeine affect weight loss and physical activity? Caffeine encourages several small metabolic changes, and all these changes encourage the use of fat for fuel instead of glucose. But how does caffeine trigger all these small changes? The answer has to do with adenosine’s throne. Okay, so let’s say that adenosine has a throne that only adenosine can fit into. When adenosine sits on its throne, it can send signals to make us sleepy. Fortunately for us, caffeine is similar enough in size to fit adenosine’s special throne. When that happens, caffeine blocks adenosine, preventing those sleepy signals from being sent. But adenosine has more than one throne. In fact, we have adenosine receptors all over the body. Interacting with all those adenosine receptors is how caffeine is able to trigger these small metabolic changes that encourage fat-burning over glucose-burning for fuel. Both caffeine and exercise raise heart rate and blood pressure, so combining them can have a scary, additive effect. In general, 200 mg caffeine per “sitting” or occasion is considered safe by multiple sources, including the EFSA. But if you’ve never consumed a pre-workout supplement or other source of caffeine before a workout before, start small. We’ll talk MUCH MORE about caffeine and fat metabolism/weight-loss when we get to the GREEN TEA section of this book. For now, let me just say that no one should expect an energy drink to be a safe or effective weight-loss method. 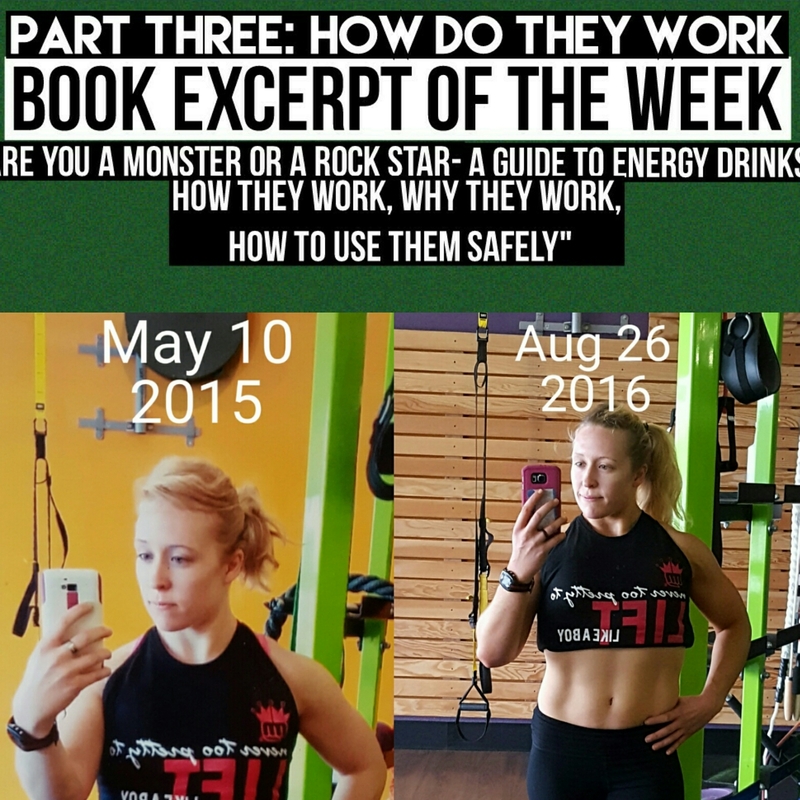 If an energy drink helps you make it to your workout, that’s a different story. Remember – caffeine is not a miracle weight loss tool! When is the last time you saw a story or post about someone who lost weight because they started drinking Product X? Unless it comes with a diet and exercise regime, you can ignore that story. An energy drink may give you wings, but it will not make you lighter all by itself. 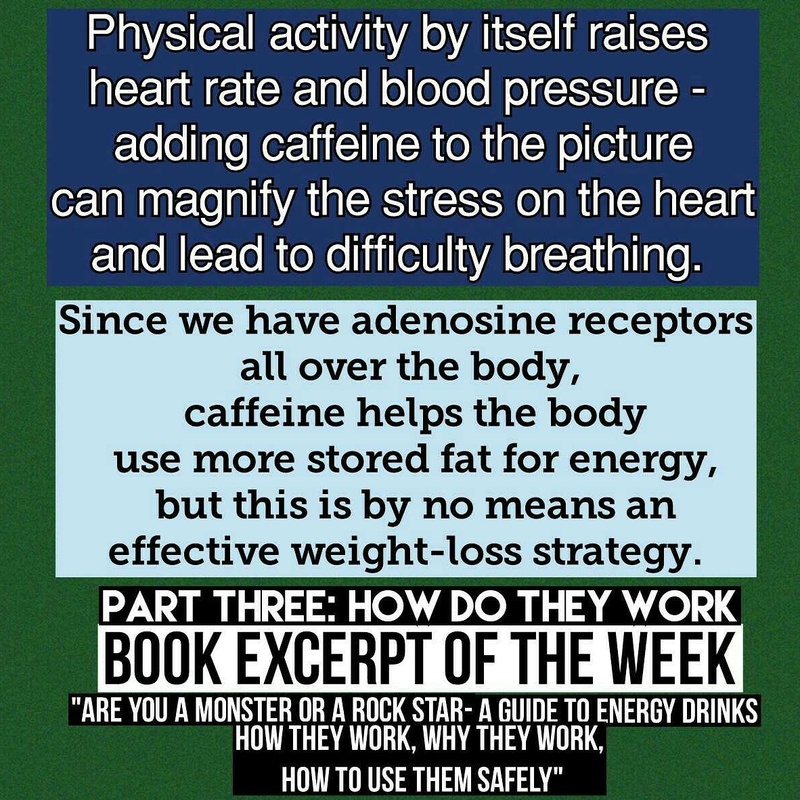 You can get your copy of “Are You a Monster or a Rock Star-A Guide to Energy Drinks: How They Work, Why They Work, How to Use Them Safely” on Amazon and wherever books are sold. Stay tuned for next week’s book excerpt, as we continue to move page-by-page through the Energy Drink Guide. Don’t forget – you can follow GreenEyedGuide on Instagram, Facebook, and Twitter!